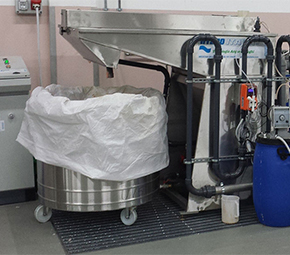 maintenance costs up to 90%, avoiding the formation of scales and waste sludge. This can be obtained by means of a turnkey, simple and automatically controlled paint sludge skimmer system, ensuring very low maintenance costs. The first step of the treatment consists in a very quick denaturation process of the small paint particles ("paint overspray") captured by the water wall. Denaturation consists in transforming sticking and coloring paint into inert particles, similar to moist sand. This aims at preventing pipes and pumps from being clogged and at avoiding the formation of scales, although denatured paint particles drop in the water wall. To obtain this type of reaction, we use suitable chemicals viz. coagulants & flocculants, which will be completely mixed with water. This is the reason why we sometime change the tank configuration and install submerged mixers. Coagulation water treatment & flocculation involves the addition of polymers that clump the small, destabilized particles together into larger aggregates so that they can be more easily separated from the water. The coagulation water treatment-flocculation process is used as a preliminary step before the actual physical separation of the sludge. The second step consists in separating the denatured particles, which are transformed in to large flakes that can easily float. The water to be treated is continuously taken from the tank located underneath the cabins or sludge pit. Water is delivered to the paint sludge skimmer system by a special pump. At the entry of the paint sludge skimmer system a static mixer is installed. The flocculent is dosed at the inlet of this mixer with the help of a dosing pump. Water/flocculent agent flow is delivered to the flotation unit through a coiled pipe to optimize the treatment effects. Inside the tank, flowing water is enriched with minute air bubbles, which adhere to the surface of the paint particles, thus enhancing surfacing (flotation) and allowing them to be easily transferred through paint sludge skimmer. The paint sludge skimmer pushes floated sludge from the surface of the tank to the sludge collector. Clarified water is then delivered to the cabin tank/pit by means of gravity or a re-delivery pump. The coagulant is dosed in the clean water leaving the paint sludge skimmer. The sludge thickener is located on the bottom of the main tank; it is electrically controlled and pneumatically activated. It acts as an agitator for the sludge settled on the bottom of the main tank. Particles tending to settle are retained by the pump and stocked in the sludge collector. A wide range of paint sludge skimmer models are available, based on the hourly paint sludge generation rates in the paint shop, from 10 kg/hr up to 90 kg/per hr. For higher sludge generation rates, customized models can be provided.